The aim of the project is to stabilize Afghan civil society by promoting social and cultural reflection, competence and self-efficacy as important steps towards peace and reconciliation. The project builds on achievements made by the projects Mental Health in Northern Afghanistan and Mental Health Training in all Afghan Provinces, and integrates lessons learned. It aims to contribute further towards a peaceful and stable civil society by carrying out activities that will strengthen Afghan cultural and social identity, and initiate dialogues between different ethnic groups, age groups, and the genders. The project further aims to promote social responsibility on an individual and community level and though socio-cultural activities, and has a psychosocial and a socio-cultural component. Easy access to psychosocial support is the guiding principle for the psychosocial component at the community level, which will be offered through community health workers. Professional counselling services following best practices will be delivered by psychosocial counsellors through the public health system (BPHS and EPHS). The socio-cultural component of this project aims to encourage cultural reflection and expression, and to facilitate socio-cultural activities that initiate dialogues between genders and different social and ethnic groups. The idea is to dismantle polarising enemy stereotypes, which can be replaced by communication and curiosity creating common ground for cultural and social identities. “Who am I today as an Afghan in Afghanistan?” This is an important question for this project and will be asked over and over again. The question will go hand in hand with the reflection on ones own possibilities and responsibilities to contribute to a peaceful Afghan civil society and the exploration of cultural values and a social environment rapidly changing as we can observe it today in many regions of Afghanistan. The project idea acknowledges that the promotion of cultural exploration through symbolic expression forms an important aspect of re-establishing social cohesion and will address conflicts in families and communities that are based on social values expressed by modern lifestyles competing with traditional ones. This is designed to be achieved by providing space for cultural expression such as calligraphy, personal narratives, poetry and music, and inter-generational dialogue. 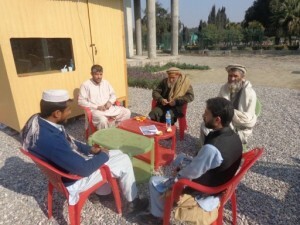 Containers serving as cultural centres have been established in Kabul, Herat, Bamyan, Mazar-e-Sharif, Faizabad, Nangahar to host such discussions and activities.